The names of the main stars are: Alcyone, Celaeano, Electra, Atlas, Merope, Sterope I & II, Taygeta, Maia, and Pleione. According to the Maya, our solar system rotates around Alcyone, the central star of the Pleiades, in a 26,000 year period; (Note that this last part, about our solar system rotating around Alcyone has been proven incorrect). Taygeta supposedly is the sun of the planet 'Erra' where Billy Meier's contacts Semjase & co. came from. Based on what contactees have been told, the Pleiades group is the home of a humanoid species. The Pleiadians are most similar to Earth humans. Earth humans supposedly were created by using mainly Pleiadian DNA. About 250 planets in the cluster would be inhabited. The Pleiadians splintered off from the Lyran group. Some used (and are infused with) Earth genetics too. Mainly caucasian, with a lot of variety, much like on Earth. They can range from 5 feet to 7 feet. Their eyes are bigger than human eyes, and the tone of the color of their eyes is different too. Many "Blonds" or Nordic type aliens that contactees encounter come from the Pleiades. (Or at least that's what they claim). A number of authors also mention a Pleiadian race that looks like the Latin American Indians (Mayas, Incas, etc.). The Pleiadians are part of the Federation of Planets, though there are some renegade / break-away factions. Some of these - mainly from Alcyone - joined the Draconian Empire (per A. Collins), while others prefer to stay neutral. In Greek mythology, the Pleiades, meaning the doves, was the name given to the seven daughters of Atlas and Pleione, daughter of Oceanus (one of the Titans). Their names were Electra, Maya, Taygete, Alcyone, Celaeno, Sterope and Merope. 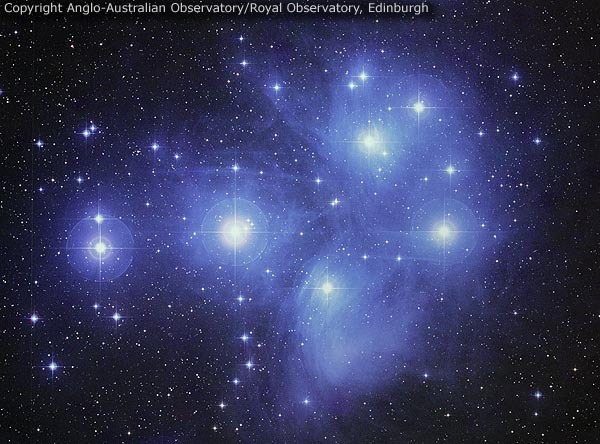 There are several different myths with regard to what happened to the Pleiades. According to one story they committedsuicide out of grief at the fate of their father Atlas. Another story says that they committed suicides out of grief at the fate of their sisters, the Hyades. Another myth tells that they were the attendants of the goddess Artemis, who were pursued by Orion. They were saved by the Gods who changed them into doves. After their death they were transformed into stars.